Jade appeared at cafes, clubs, universities and folk festivals around the country and were regulars at the Wellington Folk Club in Holland Street. They also recorded an album of British and Irish folk songs. Television appearances included New Faces, Grunt Machine, and the Max Cryer show (on which they appeared as the Gumboot Orchestra and Chorus, as winners of the Viking Records Topical Song Contest). Jade disbanded in 1977 when members headed off on their big OE, but they still get together to play music whenever they get the chance. In 2006 Jade played concerts at the Wellington folk music club (Acoustic Routes) and the Levin Folk Club to commemorate 30 years since they began. 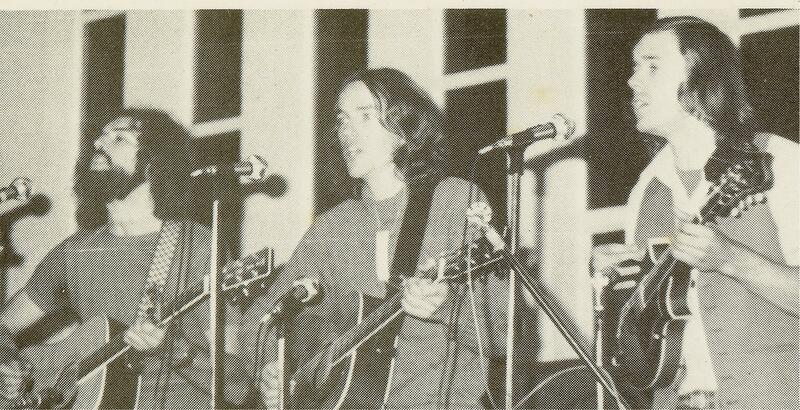 All three members of Jade have remained active in the folk music world. David Chadwick plays as a solo performer and in various bands. He has recorded programmes of his original songs for Radio NZ. He has also released albums on Replay Radio and more recently a self-produced CD entitled “The Hard Edge”. Mike Dew is also a member of several musical groups, past and present. Many of these have had a strong folk influence, including Wild Geese and Regional Tongue, both of whom have been guest performers at the National Folk Festival. Wild Geese have recorded a number of CDs of traditional and original Irish music and currently have a new CD in production. In 1997 they won ‘Folk Album of the Year at the NZ Music Awards for “Betwixt Time and Place”. In 2007 they were invited to perform in Messines, Belgium as part of the 90th commemorations of the First World War. Peter Conway has been a member of Red Gumboot and Celtic Flame and also played in an Irish pub band in London. In recent years he has teamed up with Robbie Duncan and Victoria Smith and he also continues to perform in Spanner in the Works, a band whose repertoire has a focus on workers’ rights and social issues. Over the years, Peter has also added his mandolin to the performances of well-known folk artists such as John Sutherland and Martha Louise.